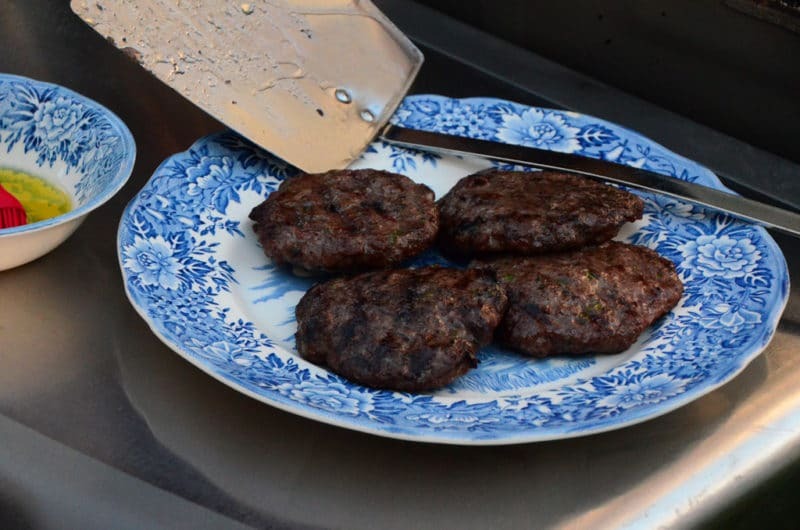 Kofta burgers are a version of the classic spiced Lebanese kofta–highly seasoned ground lamb (beef works too! ), char-grilled. Typically kofta is served in the shape of a log, pressed to a skewer to hold its shape. Don’t get scared off of these burgers thinking that “kofta” (also: kefta, also: kafta) can’t mean burger. Traditionally the highly seasoned ground lamb is pressed to a stick and grilled. You also see kofta shaped and grilled as a log without the stick. All of that is fine, but that look, that log look…frankly this does nothing to tell us that what we’re about to eat is out of this world. Incredibly flavorful. Delectable. Enter the lamb kofta burger. I figure as long as the paper placemat and the fattoush are getting reinvented this week, how about the kofta too? 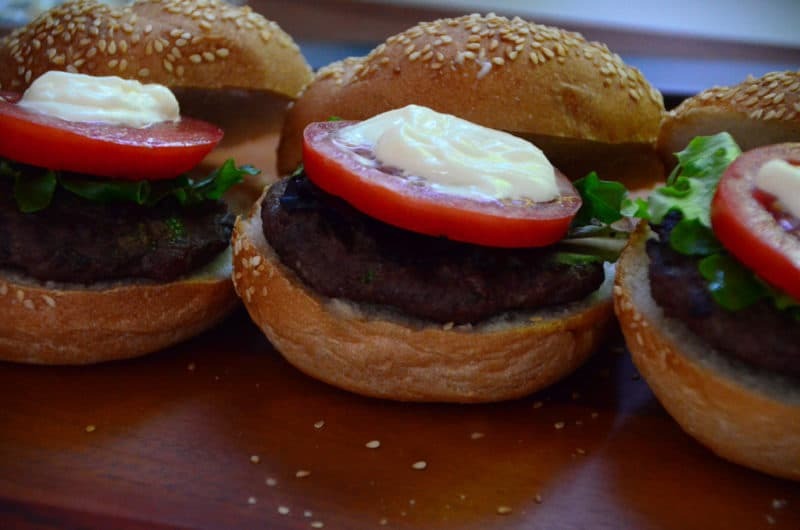 You can eat the lamb burger my way, with toum garlic sauce, or your way, with anything you want (ketchup, or as Sitto would say: cats-up, mustard, or even hummus spread on top). If you want the garlic but are not about to make any toum, substitute mayo with minced garlic stirred in. Tuck the burger into a bun, or roll it up in a big flat pita with some veggies. Or eat it as my mom and I do, with fork and knife and no bun whatsoever. That’s not how Dad would be eating his; he’d want that soft bun cradling his burger, thank you very much. Line up your lamb burgers with your hummus, your fattoush and potato salads, your veggie skewers and almond-cherry ice cream–and there’s a cookout to love.. The size of the burgers can be whatever you’d like; just be sure to flatten them out as much as possible when shaping, so that they don’t get too thick and puck-ish when they cook. The raw meat mixture becomes quite soft with all of the seasonings and onion, so it’s helpful to chill it for a half hour or up to a day before grilling. 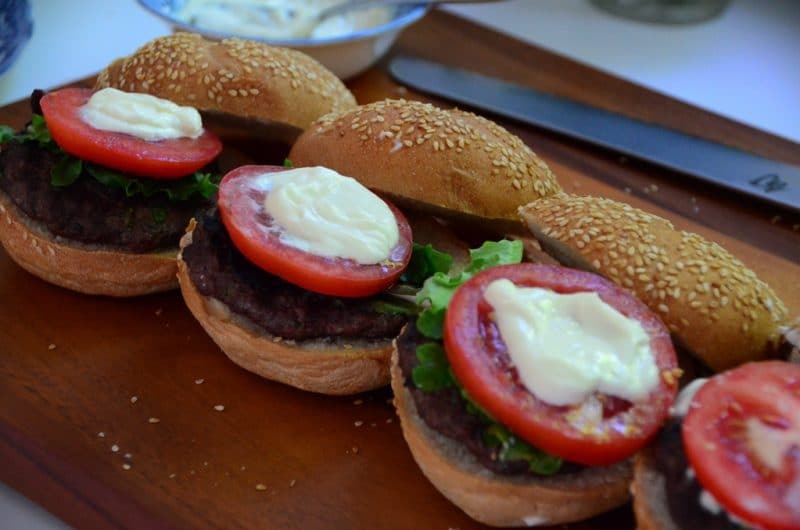 Dress the burgers with toum garlic sauce, or standard mustard and ketchup. A quickie garlic sauce is mayonnaise with some minced garlic stirred in. Combine the lamb with the onion, parsley, mint, salt, pepper, sumac, and cinnamon. Shape into 4-6 flat patties. Dip your hands in cold water if they become sticky, and to help smooth the meat into the patty. Place the patties onto a wax paper lined plate and chill for ½ hour or up to one day, covered. Heat the grill to medium high heat. Brush the patties with olive oil. Grill about 4 minutes per side, or until cooked through. Serve on buns with condiments. 6 Responses to "Kofta Burgers"
Had your potato salad last night with lamb burgers, grilled eggplant and grilled zucchini. Safe to say I have never enjoyed a burger meal so much. The potato salad, all lightened and brightened with mint and lemon, and the lamb burgers…will have to try this recipe too soon, because it is my new favorite meat. Just mayonnaise, cucumbers and tomatoes. Amazing. Thanks for the inspiration and recipes! That is music to my ears (and eyes), Amanda! So glad I discovered Rose Water & Orange Blossoms, your wonderful stories and mouthwatering recipes. I grew up watching my Lebanese grandmother make these amazing meals and would give anything to have her recipes. I am going to try the Kofta burgers this weekend with ground turkey as I don’t care for lamb or beef. Do you think substituting turkey will work ok? Thank you Dania! Yes, by all means use ground turkey, perhaps adding a touch of olive oil into the mixture to prevent it from being too dry. It’ll be great!. Let us know how you liked it! 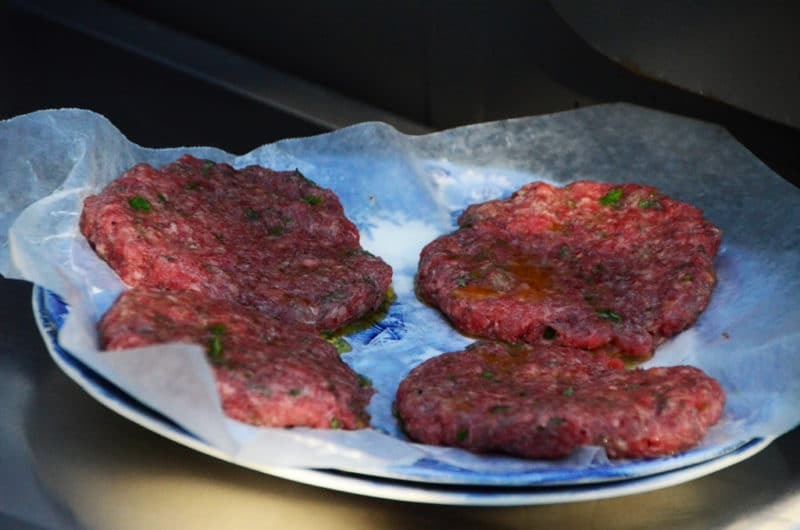 When making the Lamb Kofta Burgers, try using American (Colorado) lamb meat. Australian and New Zealand lamb meats are too strong and gamey for this recipe. Grass fed Colorado lamb meat is Halal meat and is very tender. For me and my family, it is the only choice.